Ever wonder what your dog is trying to tell you? Well, now you may be able to hear what it is thinking thanks to a new product by Indiegogo called No More Woof. In short, this is a small device that you put on the head of your dog, and it can actually translate a growl or bark. The machine will then turn these sounds into simplistic English phrases so that you know for sure what your dog is thinking. 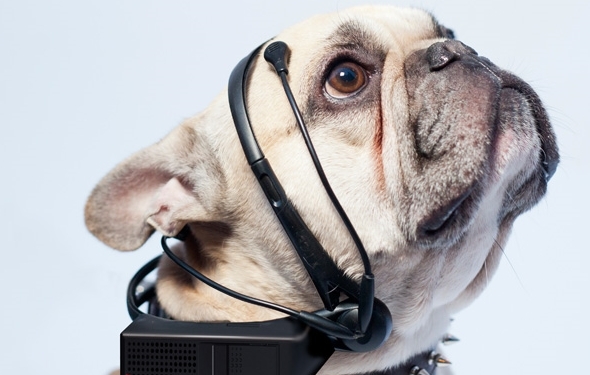 No More Woof is a headset that is designed to sit on your dog’s head. According to Indiegogo, the headset uses a Raspberry PI computer. This computer will work in conjunction with other devices on the headset, such as a speaker and an EEG recorder. This recorder is supposedly able to read ionic current flow’s that occur in a dog’s brain. After much research, the group believes that it can determine what a dog is trying to tell you by the changes in the ionic currents. Now the question is, “How much does it cost?” According to Indiegogo, it will cost about $65 for the lower end model. The lower end model does not offer many translations. In fact, the company says that it can only distinguish between three different types of thoughts, including curiosity and tiredness. The more expensive models, which were not given a price point, will have a lot more translations. Would paying this much be worth knowing what your dog is thinking? That being said, remember that this is a crowd-funded project. As with any crowd-funded project, there is no guarantee that this program will be successful. That being said, No More Woof is still in its early stages. In fact, the disclaimer on the No More Woof homepage says that it has achieved some results. However, they are still far from being able to mass produce the product. It does, however, believe that the technology will be ready for people to use within the next few years. This will simply revolutionize the way that people interact with their pets. Typically, it is pretty easy to understand what a dog is thinking. It would be a lot more impressive if someone was able to reveal what cats are thinking. Either way, this technology is far from being complete. It is interesting that someone finds this important enough to do research on it. Maybe it is even more impressive that people are actually sending in money to fund a product that may never see the light of day. Guess people really, really want to know what their dogs are thinking.